« Sacred Scripture or Me? The Quran/Bible or the Believer? Who is to Blame? Here’s where things get a bit messy. Some atheists are at some fault here, but so are some of the religious believers, I think. I’ll pick on the liberal Christian first. The Bible really does say, for example, that a follower of Jesus should hate his or her family. Liberal Christians of course find plenty of other texts in the Bible to mollify this teaching and to convert it a benign applicability to Christians today. But the point is that to do this, to dilute the offensive text, they necessarily need to reset it into the context of a lot of other passages and interpretations. It comes down to interpretation. Those who accept the literal and harsh meaning of the passage are adopting a harsh and unforgiving interpretation; those who accept a liberal and soft meaning are likewise doing so through a more socially acceptable interpretation. How one interprets and applies the passage will come down to one’s personal and social circumstances. Ditto for so many other unpleasant teachings: slavery, gays, women, authorities, science, child-rearing, money and possessions . . . The interpretation one chooses to embrace will come down to one’s own personal and social circumstances. Naturally everyone will conclude that their own interpretation is really the product of sincerely humble and informed (perhaps prayerful) objective study. Their own description of their faith needs to be respected and understood. At the same time, however, someone studying religious beliefs as an outsider cannot take those descriptive accounts of the believers at face value. If they did then they would have to conclude that God inspires many different religious groups in quite different ways and there would settle the matter. The outside observer has to find an explanatory frame of reference for the different beliefs. The explanatory account will come from, say, the perspective of fields like history, psychology, sociology and anthropology. The explanatory account will not favour any one interpretation of the Bible over another. It will leave interpretations to others with more literary or theological interests. To this extent, when an ex-fundamentalist atheist says the Bible is a terrible book because it commands Christians to hate their families, he or she is quite correct. But it is equally understandable why the progressive Christian will object to this defamatory accusation. What interests the observer of this exchange is the reason the two sides embrace with conviction such contrasting interpretations of the same book. The point here is that the progressive Christian fails to allow sufficient acknowledgement to the fact that in certain social contexts and from certain personal perspectives the Bible can indeed be validly interpreted in other ways. This brings me to the ex-fundamentalist atheists who still cling to their fundamentalist interpretations of the Bible. 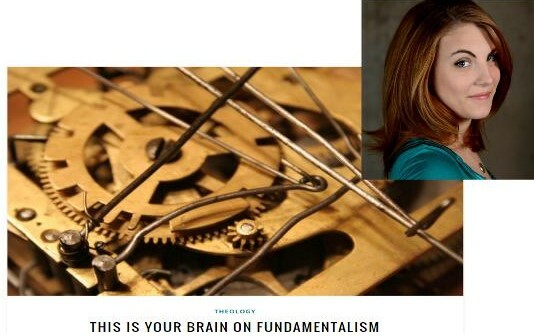 Is the ex-fundamentalist atheist still a fundamentalist? Hostile anti-theists and mere atheists are quite correct to point out that the Bible (or any ancient sacred text) does say some pretty nasty things. What they fail to understand, however, is that their own interpretation is also conditioned by their own social and personal circumstances. Understand that the Bible is a collation of diverse texts that were placed side by side in an effort to have some universal (catholic) appeal. Some passages are gnostic-like and spiritual; others are very literal and earthly; some are liberal; others are punitive. The fact that there are even some unsavoury passages at all is a consequence of the texts being written in ages past that knew different value systems from ones we adhere to today. Hector Avalos (The Bad Jesus) and Robert M. Price (Blaming Jesus for Jehovah) are correct to point out that the Bible’s pre-modern, anti-humanistic, even barbaric teachings should have no place in the modern world. The fact remains, however, that the Bible has always been interpreted by social majorities to support its own social developments. It was used to justify slavery and later it was used to condemn slavery. It was used to subjugate women; it is now used to liberate women. It was used as justification for persecution of gays, Jews and whoever else; it is now widely used to encourage love for “the other”. Atheists who attack the Bible because of its archaic values are quite correct to do so; but they are wrong to accuse liberal Christians of being hypocrites. There really is enough good stuff in the Bible to allow for a reframing of those objectionable passages and for the promotion of legitimate religious teachings of love and respect for all. I think Samantha Field is incorrect in one sense to call such atheists “fundamentalists”. They are no longer following fundamentalism. I imagine they are mostly very free-thinkers and open to new ideas. Rather, they have failed to deeply understand their fundamentalist experience and why it happened to them the way it did. Posted on 2016-03-16 09:30:04 GMT+0000 by Neil Godfrey. This entry was posted in Atheism, Fundamentalism, Religion and tagged Fundamentalism, Religion. Bookmark the permalink. The typical fundamentalist atheist, it seems to me, is an atheist who was never religious. My personal observations certainly don’t constitute a representative sample, but it has appeared to me that the atheists least likely to exhibit the fundamentalist mindset are those who used to be Christian fundamentalists. Is there any evidence that shows what percent of atheists are ‘fundamentalists’ or how many of us fail to understand our personal circumstances? As a former Christian fundamentalist it is disturbing how the language of this article conflates or moves back and forth between ‘some atheists’ and ‘atheists’. I don’t think this would happen if we were discussing, for instance, racism. I am an atheist and I assume most of the serious works on religion that I have learned from are written by atheists or at least agnostics. I am not against atheism, of course. I assumed (perhaps too much) that the context would have made it evident what I was referring to. If the cap fits wear it. It is the Richard Dawkins/Jerry Coyne type of misinformed aggressive attacks on religion that I feel uncomfortable with. We do not do ourselves favours (we=atheists) if our attacks or arguments expose our ignorance. It seems to me that liberal christians are in the position of excepting some woo and rejecting other woo. I just reject it all in all forms. I don’t see how that makes me a fundamentalist. It makes me consistent. Not only liberal but all Christians. I entirely agree with you as I would imagine most/all atheists would, too. My post is attempting to address another issue, though. I think this is very fair. Criticisms of Christianity do focus too much on scripture. There are other sources of faith. We know that Christianity pre-dates scripture, and we know actual bible canons were put together very late. For example in Catholicism the Council of Trent declared Scripture and Church Tradition as equally and independently authoritative. Other forms of Christianity have more of a role for personally revelation. Atheists attack scripture because it’s just easier to access that other sources of faith, but it’s only part of the story. If the New Testament had never been written or all copies were destroyed, Christianity could still exist as an oral tradition. It’s not remotely defamatory. The Bible does say “”If anyone comes to me and does not hate father and mother, wife and children, brothers and sisters–yes, even their own life–such a person cannot be my disciple”. This may irritate “progressive” christians but that’s their problem, atheists aren’t “defaming” anything or anyone by repeating what the Bible says and objecting to it. There are two big problems for interpretationists. (1) Not all scriptures have the same history. The Quran has a very different history to the bible, and that it wasn’t created and compiled in the same way has an effect on religious behaviour. You can’t generically equate them and hand wave about scripture and interpretation. This is a key apologist tactic in defence of Islam. (2) Scripture does matter. It isn’t all interpretation. The Aztecs genuinely cut peoples hearts out on top of pyramids because they thought that the sun would not rise if they failed to do this. It wasn’t a “misunderstanding” or failure to reframe on their part. They had delusional beliefs that stemmed from their religion. You can’t “reframe” everything, if texts give very clearcut calls for awful things this is a problem which can’t be totally solved by goodwill and creative reading. (2) Scripture does matter. It isn’t all interpretation. The Aztecs genuinely cut peoples hearts out on top of pyramids because they thought that the sun would not rise if they failed to do this. It wasn’t a “misunderstanding” or failure to reframe on their part. Correct but only at one level. See, for example, Cannibals and Kings by anthropologist Marvin Harris to see how and why a culture might come up with such a belief and practice in the first place. Some priest doesn’t just make up a lot of horrific rules and then commands everyone to obey them with the result that everyone just falls into line because of their religious aura. That’s not how humans work — though it is a comical (dehumanizing) stereotype promulgated by some atheists in their eagerness to debunk religion. One of my favourites is God instructing Moses to tell Pharaoh he intended to only pop outside the fence for a mere three days (honest!) to offer sacrifice. We wonder that these instances are not condemned in the Bible but it is interesting to remember that that in the Homeric epics Odysseus was praised for his skilled ability to deceive and trick his opponents through lies. “Odysseus of the nimble wits”. The permission of lying under special circumstances would not separate the Hebrew and Christian scriptures from other ancient spiritualities. It would actually put them all very much in line. The justification of lying hypothesis is very interesting. It resonates with much in spirituality … even shamanism …where the neophyte is taken in with ‘magic’ to attract their attention and then is taken to the Truth… and the understanding that what they initially through was magic was simply deception … and the recognition of how early they were deceived. The Holy Lie also has a history of societal structuring intentions. For example, The pious fraud or noble lie is present in Plato’s Republic in Book 2, Sections 414-7, where Plato says a functional stratified society could be realized if they could convince the people of the lie that everyone from different levels of society were created by God to exist in a certain level of society. Tony Blair is an interesting up-to-date example. I think there are active and passive atheists. I consider myself to be a passive atheist. I do not actively “not believe in God”. I simply feel no need to use a supernatural explanation for things like rain or the existence of the universe. Dawkins on the other hand is active. He promotes atheism and I assume he sees religion as harmful. I think he gives atheism a bad name but in his defence he is passionate about science and evolutionary biology. Creationists have for decades been attempting to have “intelligent design” taught in schools alongside evolution. He sees this as an attack on science by the scientifically illiterate. His response has been to attack religion. While I don’t agree with his methods I don’t think it is right to label him a “fundamentalist atheist”. I think this label shows a misunderstanding of his position. When I first read Dawkins’ and other “new atheist” polemics against religion I love them. But to a point — then that point grew to become a larger fence that troubled me. Someone has called them “anti-theists” as distinct from “passive atheists” as John describes. Their polemics hinted at an intolerance and misunderstanding of the religious members of the human race. I have just seen another blog post reminding me that the “new atheist” movement arose after 9/11 (http://freethoughtblogs.com/atrivialknot/2016/03/16/explaining-atheism-for-aces/) — and probably that is where the worry should begin. To attribute that event to mere religious belief, to use that event as the main reason for a “war” on religion, is a sure invitation to a campaign that can only fan ignorance and misperceptions. There is plenty wrong with religion, and religious beliefs have a significant place in much of the violence that has happened since, but religion is only one of a number of other very significant factors and it cannot be blamed as if it is a significant sole culprit. I would have thought it obvious that we need to ask what suddenly activated certain religious violence. When anti-theists attempt to side-step this question by saying religion (Islam, of course) has always been like this then they are simply feeding on and fanning ignorance and closing their eyes to what makes people and societies really work. Before talking about fundamentalism, perhaps there should be a discussion about scripture literalism. Martin Luther’s use of the Bible as a source of faith enabled him to bypass the Catholic Church’s authority. For that there had to be the printing press and a vernacular edition of the book. Later on, the aility to read among the protestant cultures became really widespread. Among my ex-evangelical friends, it surprises me the importance they attribute to scriptures. Scripture literalism is the exception. It was taken to extremes among evangelicals in the USA in the 20th century and seems to have had a contagion efect into Islam. Ex-evangelical atheists look like they imagine other religious people doing what they did when they were theists, perusing the scriptures to find out solutions for their faith problems. But for many peoole, the sacred texts are read, if ever they care to read them, like poetry, where the reader gets diffuse feelings or esthetic emotions from the sacred texts and then uses those feelings and emotions to proces their religious thoughts and feelings.Or a minister reads the texts aloud and the congregation shares those feelings. To those religious currents, the notion of scripture as a literal divine command is probably very strange. Books don’t speak, it is people who spoke or wrote certain texts that were incorporated into the christian bible. And many of those texts were reworked at a later stage or (mis)translated. This particular example is a very significant one because the Greek has indeed the word ‘hate’, but if there was an Aramaic unterlage then the alternative English translation is ‘forsake’ (his or her family), which makes perfect sense if you choose to follow a spiritual master, leave your worldly existence behind and want to start practising universal love. The translation ‘hate’ makes no sense if you read the rest of the Q-teachings. Some people become atheists after having been religious of even fundamentalist religious because they cannot clearly see how religion is an imperfect mixture of universal spiritual practices leading to emancipation with irrational or outdated ideas and practices that are not or no longer beneficial or even harmful in the modern world. Some people rightfully switch over to doing yoga or some other form of spiritual life style that is compatible with a rational way of thinking, but others who are out of touch with their spiritual self and are too much one-sided intelectuals may become atheists after they see through the irrational sides of religion and all together start denying the spiritual dimension beyond the expressed world as their imperfect way of trying to come to grips with their own reality. So you would rescue the Bible passage by appealing to make-believe sources behind the text and to a make-believe dimension of human nature? “Practising universal love”. What does this mean? How do you do it? What good is it? Let closed nuns pray their hearts out, and middle-class spinsters attend yoga classes, but let those with their own families treat them with responsibility and care. Of course, if one is able to go round the world, curing lepers with a glance, making the blind see with a touch, getting the lame to walk with a word, and calling the prematurely deceased from their tombs, then “follow that Master” with good wishes. Otherwise, doesn’t a global altruism amount to a fraud whereby the productive are enslaved by unfocused compassion or religious guilt into sacrificing themselves to the selfishness of the unproductive?